No, zoodles aren’t the latest new dog breed, they’re noodles made out of zucchini – and they’re surprisingly delicious. I’ve found that the best zoodles are spiralized, but you can also use a mandoline or a sharp knife (and lots of patience). Not ready for a plate full of zoodles? You can easily mix in some spaghetti noodles with your zoodles. Here are 6 delicious zoodle recipes to try out. Frozen zucchinis are great for adding to lower sugar smoothies – especially if you’re not a big banana fan. They’re also convenient to have on hand for any recipe you want to add extra veg into, like in soups stews and sauces (as mentioned below). Learn how to freeze zucchini here. Sick of sweet pancakes? Okay, you’re probably not. But whether it’s breakfast, lunch or dinner, savoury pancakes are an equally delicious option. These summer squash pancakes are a great way of using up a bounty of summer squash and they can even be frozen for an easy and quick meal. Can you eat cookies for breakfast? You’re an adult (probably), of course you can! But, can they be healthy? You bet! Now quit asking so many questions and make some cookies. They’re loaded with tons of healthy ingredients, including zucchini. Get the breakfast cookie recipe. 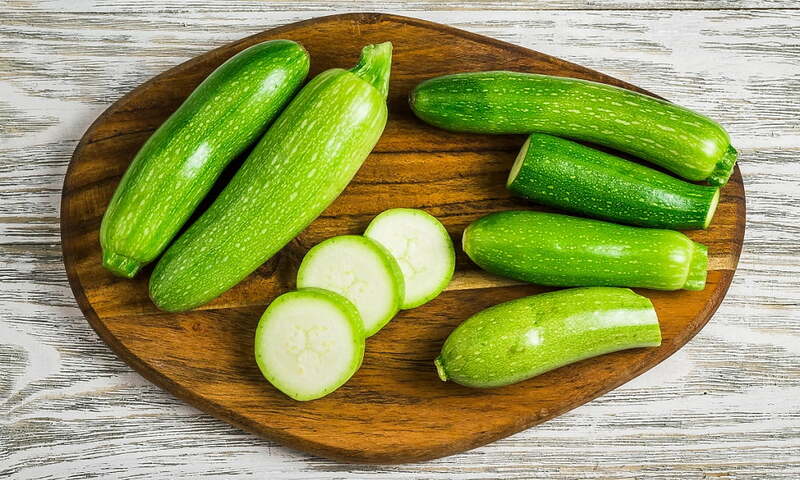 Zucchini has a very neutral flavour and a fairly unobtrusive texture that can blend well into many different recipes. It’s especially well suited to adding in soups, stews and sauces. Depending on the desired texture, you can grate, chop, or even blend zucchini to fit with the recipe. It’s a great was to add in extra veggies! I know this sounds weird, but as previously mentioned, zucchini has a pretty neutral flavour and It allows the other flavours it’s paired with to really shine through, while providing a satisfying thickness to your recipe. Don’t knock it until you try it! Get the recipe. You’ll want to stuff your face when you try stuffed zucchinis. They make an easy and delicious dinner, and the options for customizing the flavours and ingredients are endless! This vegan jackfruit stuffed version is a delicious option to get you started. What other ways do you like to use zucchini? Let us know in the comments or on social media! next post: Wondering What’s In Season And When? Check Here!